Whaling began in Tasmania with the beginnings of white settlement. Early colonists observed large numbers of southern right whales (Eubalaena australis) in the bays and inlets along the coast during their annual migration north from Antarctica. In July 1804 Knopwood claimed that in crossing the River Derwent, 'we passed so many whales that it was dangerous for the boat to go up the river unless you kept very near the shore'. Given this seasonal abundance of whales and its proximity to the Pacific whaling grounds, the new colony was ideally placed to produce whale oil, which was in demand in Britain for street lighting and industrial processes. Whalebone from 'baleen' whales was also utilised in the women's fashion industry. William Collins established Tasmania's first shore-based whaling station at Ralph's Bay in 1805. The lifting of a number of port and trade restrictions in the 1820s led to the expansion of the colonial whaling industry. Stations were established at Recherche Bay, Bruny Island, Southport, Spring Bay, Maria Island, Freycinet Peninsula, Forestier's Peninsula and Bicheno. Whalers operating out of the northern port of Launceston also set up stations along the South Australian and Victorian coastlines. Local whaling entrepreneurs, including Captain James Kelly, Alexander Imlay, Charles McLachlan, Henry Reed and James Bayley, were speculative businessmen who engaged in whaling in conjunction with other money-making ventures. In the period from 1828 to 1838, close to 3000 southern right whales were caught by Tasmanian operators. The typical shore-based station consisted of a crude camp and on-shore processing facilities which employed 20–30 men during the winter months when whales were plentiful. It was a hazardous and physically demanding occupation which could earn the men substantial rewards in a good season, but just as easily leave them near broke in a bad one. Under the 'lay' system they were paid a fixed proportion of the season's catch, providing an incentive for hard work. By the 1840s there was a rapid decline in whale numbers visiting Tasmanian shores. Together with changing consumer demands and economic pressures, this led to a shift away from shore-based whaling to pelagic (deep sea) whaling. Long voyages to the sperm whaling grounds in specially fitted out ocean-going ships required greater capital investment and more skilled labour. At its peak, in 1849, the Hobart whaling fleet consisted of 34 vessels, all of which were Hobart owned and operated. 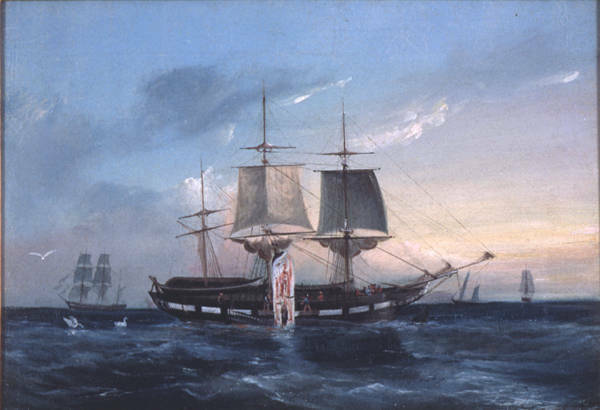 The majority of whaling masters and officers were from the colony and their enterprise led them to achieve positions of considerable respect in business and the government. Experienced seamen and whalers from many parts of the globe, including Britain, America, the Pacific and the West Indies, were recruited from visiting whaling ships to work in the local industry. The Tasmanian whaling industry contributed to the colonial economy directly through substantial export earnings, and indirectly through the development of mercantile and port facilities and its links with shipbuilding and ancillary industries. From 1830 to 1900, a total of 103 vessels were engaged for colonial whaling, many of which were constructed or fitted-out at local shipyards. The local industry also employed thousands of Tasmanian and foreign whalers, who in turn, ensured a lively trade at the many public houses and businesses around Hobart. By the late 1870s and 1880s the Tasmanian whaling industry was in decline due to the indiscriminate killing of whale stocks, a lack of sustained investment by local entrepreneurs, as well as external factors such as economic depressions, falling oil prices and the decline of Hobart as a major port. The last Tasmanian-based whaling voyage was completed with the return to Hobart of the Helen on February 22 1900. Further reading: S Chamberlain, 'The Hobart whaling industry', PhD Thesis, La Trobe University, 1988; M Nash, The bay whalers, Canberra, 2003.